George Whitefield was born at the Bell Inn, Gloucester, England, on December 16th 1714, so the release of this addition to the Bitesize Biography series commemorates his 300th anniversary. And it is fitting that Michael Haykin should be the author: he is the series editor of the 'Bitesize' and an internationally-recognised Christian historian, with a special interest in the eighteenth century. Steven J Lawson, President of OnePassion Ministries says: George Whitefield was arguably the greatest evangelist of church history. His passionate love for Christ and ardent zeal for lost souls endowed him with the fervor necessary to span two continents with the powerful message of salvation. 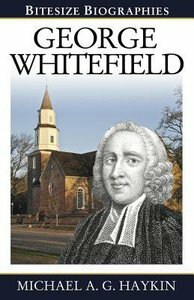 In this fresh snap-shot of the life of George Whitefield, Michael Haykin makes it clear that Whitefield was not only a force for God in preaching, but was marked by an intense biblical piety. The humble servant he was on his knees before God shaped him into the roaring lion he became before men. A recognized scholar, Dr. Haykin brings historical clarity and devotional meditation to a virtually unparalleled life, which is, according to Dr. Martyn Lloyd-Jones, almost forgotten in church history.This is a welcome biographical sketch of George Whitefield from a revered historian whose love is the same as his subject - Jesus Christ. About "Bitesize Biographies: George Whitfield"
Michael A. G. Haykin (ThD, Wycliffe College, University of Toronto) is Professor of Church History and Biblical Spirituality at Southern Baptist Theological Seminary, KY. He is the author of a number of books, including The Spirit of God: The Exegesis of 1 and 2 Corinthians in the Pneumatomachian Controversy of the Fourth Century (E.J. Brill, 1994); One heart and one soul: John Sutcliff of Olney, his friends, and his times (Evangelical Press, 1994); Kiffin, Knollys and Keach: Rediscovering Our English Baptist Heritage (Reformation Today Trust, 1996); At the Pure Fountain of Thy Word: Andrew Fuller as an Apologist (Paternoster Press, 2004); Jonathan Edwards: The Holy Spirit in Revival (Evangelical Press, 2005); and most recently, The God who draws near: An introduction to Biblical Spirituality (Evangelical Press, 2007) and The Emergence Of Evangelicalism (IVPUK, 2008).